SURPRISE – Hana Papaco is a tennis player at Ottawa University in Surprise. On this particular Wednesday afternoon, she walks onto the tennis court like she has done countless times in her life. Today is different though. Today she won’t be facing another tennis player as her opponent. She won’t be staring across to see someone wearing her rival school’s colors. Today her competition is herself. 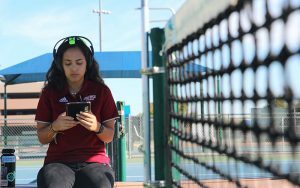 “Hana has got a lot of energy; she thinks a lot; she analyzes a lot; she’s pretty intense; she is kind of a perfectionist out there; she wants things to always go a certain way, and if not she will get a little bit rattled,” Ottawa University men’s and women’s tennis coach Brad Louderback said. On this day, Hana will be experimenting with a Versus device and Dr. Leslie Sherlin, the CEO and chief science officer at NeuroTherapeutics. 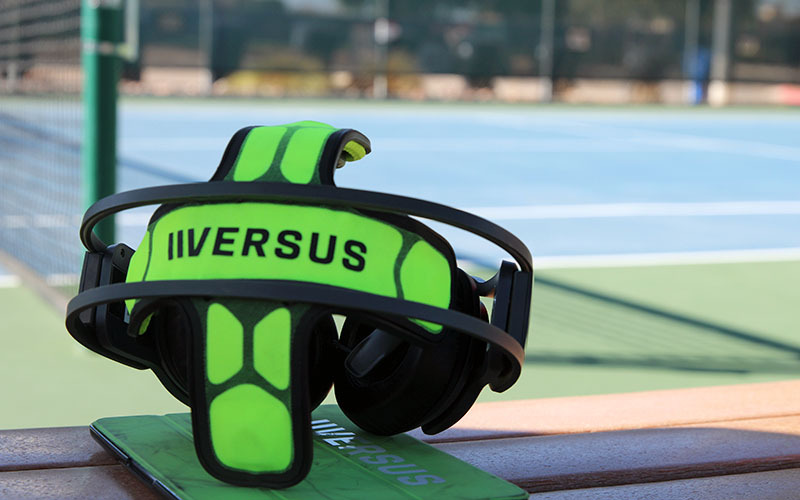 Versus features a headset and works in conjunction with a mobile app. The headset looks like something you can buy at a local electronic store, and if you see someone using the device it looks like they are involved in an intense game that they downloaded on their phone. Versus, however, is much more than a game. It is a state-of-the-art strength and conditioning tool for your brain. The goal of Versus’ brain-sensing technology is to allow you to learn the most favorable mental state so you are able to perform at your best. Electroencephalography, a monitoring method to record electrical activity of the brain, is becoming increasingly popular in the world of sports. As early as 1924, German neurologist Hans Berger attached electrodes to a subject’s head and read electrical impulses, inventing the EEG. Around 1980, scientists started looking at how these methods could benefit athletes but only recently did it become a training tool. One example is Versus, which is being used around the world. 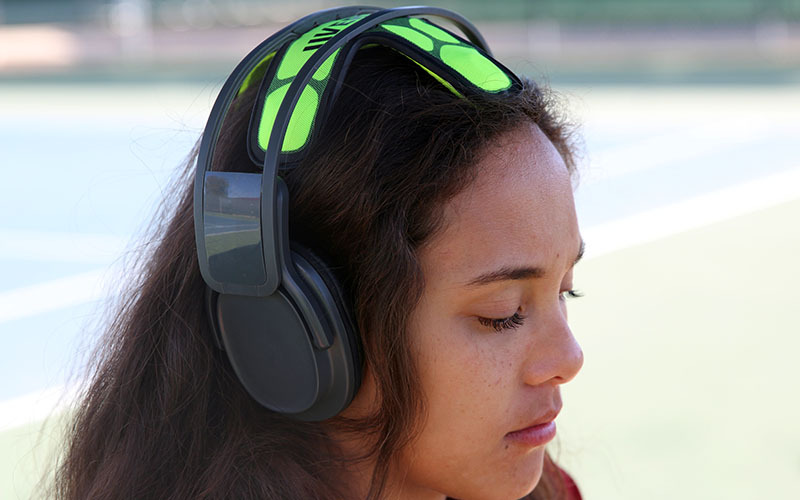 From NBA All-Star Kyle Korver to beach volleyball Olympic gold medalist Kerri Walsh Jennings to former MLB All-Star Carlos Quentin to kids as young as 6, athletes are using the technology to try and gain an edge. Sherlin, co-founder of the technology, has worked with athletes to help take their careers to the next level. That level could come in the form of breaking out of a slump or helping them thrive in high-pressure situations. The Versus technology takes people through simulations that re-create high-pressure situations. “Versus employs exercises which strengthen the physiology of the brain so then it can translate over (to the environments of competition),” Sherlin said. “The games start very passive — you are trying to make a hot-air balloon just rise by getting in the right brain state. “Then we add an element where you are having to manipulate the game, like stay on a track or fly a plane through rings, and you are continuing that process. 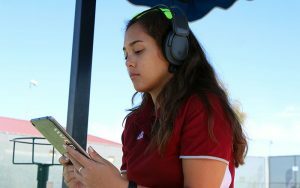 “Then lastly you have to interact in a little golf game where as you create the right brain state you have to identify that and then engage and interact the device,” Sherlin said. Hana, now engaged in one of the exercises, sees three circles at the bottom of the screen, showing what kind of brain state she is in. The more the circles overlap, the better brain state she is in. If the circles all come together, that means she is in the perfect brain state. To simplify, if Papaco isn’t in the right brain state — if she doesn’t control her breathing, or her focus is off – the hot-air balloon stays on the ground, the plane crashes, the race car doesn’t start and she can’t hit the golf ball off the tee. These games replicate high-pressure situations similar to an athlete lifting weights. Athletes use the weight room to get stronger and improve at their sport. They are not lifting to just master lifting itself. They are lifting because lifting will help them master their skills on the field. Depending on the state of mind Papaco is in, she describes herself as “mediocre” at high-pressure situations. “Some days (when) I’m totally zoned out I can totally focus in, and some days I think about the littlest things like, ‘Why is that bird chirping?’ she said. All four games for Papaco had similar results. She struggled at the beginning and had to regroup and focus. Occasionally she would get frustrated and would have to come up with a new strategy. When the hot-air balloon was in the air for an extended period of time and she saw her score go up, her confidence grew, leading to better results. When the plane kept crashing, she had to make an adjustment to try to go around the mountains instead of over them. When she struggled getting the car to move or hitting the golf ball, and her frustration really started to kick in, she needed to take a moment to herself. These are similar situations to what athletes often need to overcome while playing their sports. When an athlete is feeling confident, their play often is taken to the next level; when a move isn’t working, they have to make an adjustment; and when frustration kicks in they have to relax and refocus or they won’t be successful. “It is funny how after every single game we would talk about it (and) I would always have so many things to relate from the game to tennis,” Papaco said. When Papaco made this connection, her eyes widened like a lightbulb went off in her head. Sherlin’s reaction was similar to a kid reacting to walking into a candy store. “From the first time, usually there is this validation point of when finally I can quantify something — I can put a number, I can put some definition around what previously was a little bit squishy for them or not being tangibles,” Sherlin said. What happened to Papaco is similar to the work Sherlin does with other athletes. “Many times, the individuals are like, ‘Oh, I thought it was just my head,’ and it literally is their head, but it’s the way they are wired,” Sherlin said. “So being able to understand, ‘Oh, that’s why I have fatigue late in the third quarter — not because there is something wrong with me — it is because my brain is wired I need to manage that energy in a different way,” Sherlin said. And this device wasn’t just made for athletes. Athletes just happen to be the starting point. “It was just kind of a natural fit,” Sherlin said. 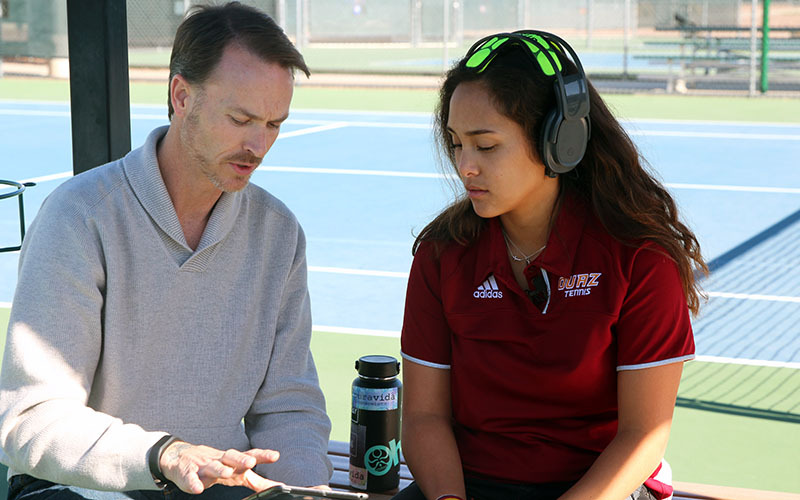 “As a sports psychology consultant, we had a lot of individuals who were looking to enhance performance, and controlling your physiology is an essential piece,” Sherlin said. Physical gifts aside, Sherlin believes there is no reason why a non-athlete can’t have the same mental endurance as a professional athlete. “All of us have the capacity to be better at what we are doing than we are right now,” Sherlin said. The Versus device aims to help people increase their quality of life for a longer period of time. “As we start to get into things that are becoming really aware of end-of-life types of stages we want to maximize the time we have, maximize the productivity, stay in our jobs longer, and enjoy our families longer,” Sherlin said. Versus could also help people with learning disabilities. “To say that it cures fill in the blank diagnosis from a mental health standpoint would be too strong of a statement at this point,” Sherlin said. Sherlin believes Versus could one day be as normal as someone using a treadmill.